2007 Cavco Elite w/AZ room. 1bed/2bath. Approx. 965 sq. ft. per owner. The best of the best in this home. Mountain views from tiled deck, 2x4 construction, all concrete pad, oak cabinets, oak furniture & oak base boards. Fully furnished w/high end,stunning decor. Front kitchen w/Corian counter tops, deep sinks, flat top stove, built in microwave, RO, disposal, side/side fridge w/RO water. AZ room has 3/4 bath, laundry room w/newer full size washer/dryer & extra fridge & built in cabinets. Bedroom has queen lift & store bed, lg. mirrored closet w/TV, built in dresser & end tables. Full master bath. Attached shed w/water softener & storage. Sunny back patio w/pavers behind unit. Too many extras to list. 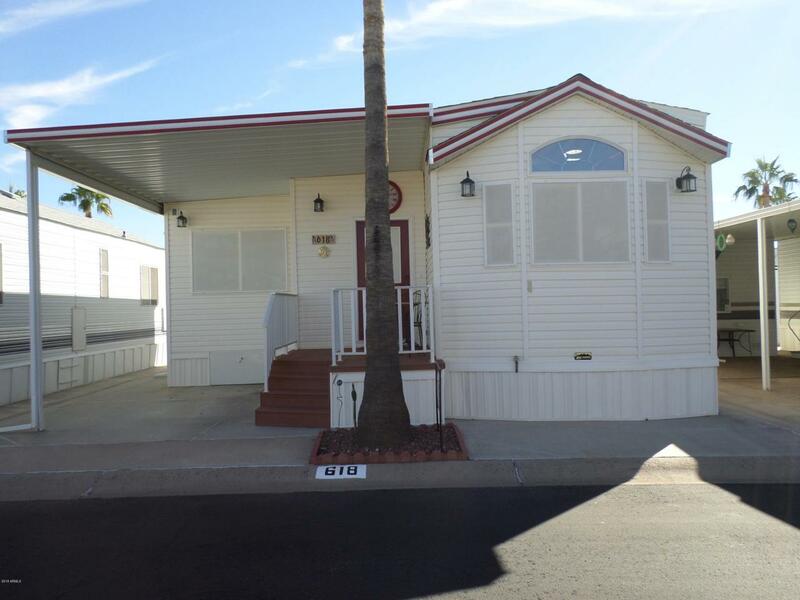 If you appreciate a newer, high quality unit in Golden Vista Resort, this one is for you! Listing courtesy of Century 21-Towne & Country.